Work Stress? We can help. Are you in management? HR Department? Are you a business owner? An invested employee? You can walk into your office and feel when your team is stressed out. Maybe it’s work related, maybe it’s not. Either way, it’s affecting your work environment, employee moral and productivity. When your team has their mind on other things the task at hand is going to suffer. You see it, the numbers show it. But work needs to be done regardless of the amount of stress in or out of work. So the question becomes, what do you DO about it? But you say, I can’t pay my employees to just sit and get a massage, let alone paying someone to come in and give massages to my staff. You can’t afford not to, and it’s not as expensive per employee as you think. Field, T., Ironson, G., Scafidi, F., Nawrocki, T., Goncalves, A., Burman, I., Pickens, J., Fox, N., Schanberg, S., & Kuhn, C. (1996). Massage therapy reduces anxiety and enhances EEG pattern of alertness and math computations. International Journal of Neuroscience, 86, 197-205. Cady, S. H., & Jones, G. E. (1997). Massage therapy as a workplace intervention for reduction of stress. Perceptual & Motor Skills, 84, 157-158. Yeah, like we said, you can’t afford not to. 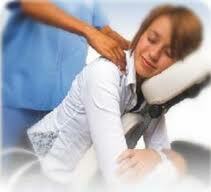 Chair Massage does all of this for you and your team for very little time and very little out of pocket. Your staff works hard, YOU work hard. Think about the last time you were acknowledged for your hard work. Doesn’t it make you want to work harder? Be more loyal? Speak praises about your job? What happens if ALL of your employes are doing these things? Working harder? Being more loyal? Bragging about how awesome their job is? How does that contribute to your profits? Customer satisfaction? Employee retention? Interested? Have more questions? Please fill out the contact form below and we’ll get back to you within one business day. You can also visit our website here. Our staff has been serving the Fort Collins and Northern Colorado area for over 12 years. We work with businesses of all sizes and can work with you to find a schedule that works best for you and your company. We provide all of the tools that you will need to make your event organized, efficient and fun! Mention this post and get 20% off your first On-Site Workplace Chair Massage event!